Mohanlal, the most popular actor in malayalam film industry makes news. Whether it be the first look poster of a movie or his Brazilian visit to watch football, his fan followers in the social media would not leave anything they get to celebrate. While the actor is enjoying his days in Brazil, a special guest is waiting for his return. 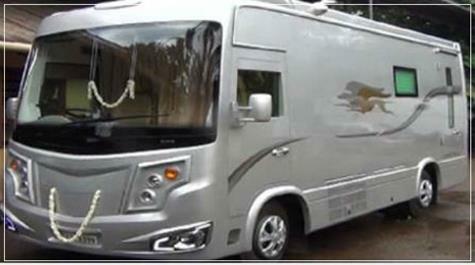 The talk is about Mohanlal's new Caravan which comes with the most luxurious features as seen inside a modern home. Designed by Ojus Automobile Kothamangalam, this van boosts of being equipped with some of the most innovative features. The new caravan made after the instructions taken from the actor works completely on remotes and touch screens. This highly sophisticated vehicle has massage chair, a satellite dish, a music system, a vacuum toilet, an automotive AC and every luxury which truly matches the image of the superstar. The highlight of this vehicle would be the doors that open with remotes and a touch screen which fills water in the bathroom. The cameras which are fixed inside and outside of the Caravan give more comfortably to the actor. He has the luxury of watching everything which happen outside his van while could see the inside of the caravan from his home itself. Ojus Automobile which has also designed caravans for actors like Mammootty, Suresh Gopi and Prithviraj call this new vehicle as 'Chamber' or 'Creation Vehicle'. Having 20 feet length and 7 feet breadth, this vehicle has been designed after considering various factors including the size of the road and parking area. Ordered four months ago, this vehicle has been handed over to Mohanlal's drivers Anil and Anish. Caravans or RV's are mostly used by celebrities and business tycoons. Each caravan is well designed to suite the interest of the owner. These travel trailers has the ability to accommodate a large family.